On March 21st, 2015, waygooks and Koreans alike flocked to a small island in the southwest corner of the country…to flock to an even smaller island! Known as the Jindo Sea Miracle, for just a few days each year a natural phenomena occurs along the coast of this region that causes the tide to perfectly retreat from two directions, making it possible to walk from the main island of Jindo to a small neighboring island, Modo. 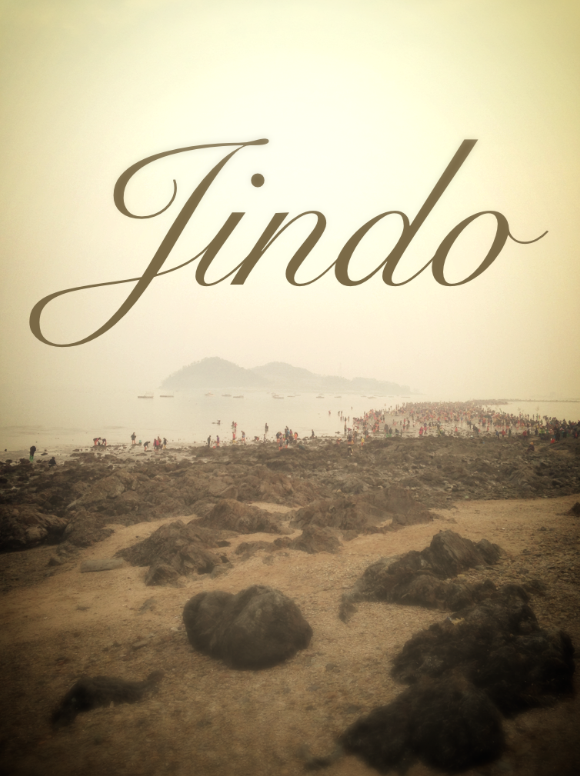 The legend of the sea parting goes like this, “Jindo was once an island abundant with tigers. When the tigers began invading the local villages, people fled to the nearby Modo Island. Unfortunately, Grandmother Ppong was left behind. Wanting to see her family again, she prayed to the Dragon King of the Sea every day until finally, the Dragon King answered her prayers by making a path appear between Hoedong Village and Modo Island. This path later became known as the miracle sea path and thus began the annual tradition of the Jindo Miracle Sea Festival” (Visit Korea). Cool story, huh? My only question is, did they really not have BOATS or RAFTS back then? I mean…did a family seriously leave their poor, helpless, beloved grandmother to fend for herself against a bunch of blood-thirsty tigers for presumably the rest of her life? Ouch…. These days, the festival is more than just a free-for-all parade across the sea. The island is also known for breeding Jindo dogs, so it features an entertaining dog show and a puppy pen where you can get your fill of cuddly cuteness. Traditional dance and singing performances rotate on the main stage throughout the day, and there’s no shortage of food venues to choose from. Once the sea parting is finally underway, you can even bring your own digging supplies to go hunting for clams and other sea creatures. Just be sure to do it quickly! The tide only goes out for about an hour and a half so there isn’t much time if you want to clam, take pictures AND walk the whole way across. Usually only the people at the very front of the mob make it all the way to Modo island. Everyone else gets told to turn around from where ever they stand. I guess Grandma Ppong was a fast walker! Additionally, while they’re not necessary, thigh-high wading boots can be purchased for $7-8 upon arrival. A few people opt to go without them, since the beach/walking path is mostly sand. But if you’re looking to fit in with the k-crowd, I’d recommend the boots with just one additional suggestion: it’s convenient if you wear pants that have belt loops (the way the waders attach to your clothes to keep from falling down makes it easier if you do). All in all, it was a lovely afternoon with beautiful weather and great people! The bus ride from Ulsan was a long 5 hours, but the trip was conveniently organized by Enjoy Korea so we didn’t have to worry about travel logistics. If you’re putting together a bucket list of things to do and see in Korea, be sure to put this festival on it!